You'l be passing through rolling hills, farms, mountians, and quiet peaceful countryside (This route continues into Virginia - Southwestern Virginia - Sweet Chalybeate to Monterey). 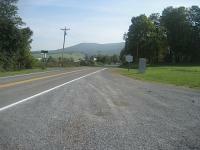 Very few twisties, some nice sweepers, road is well maintained, nice rolling hills. One of my favorite rides anywhere. Small towns and a little shopping along the way. Union is a very nice little town with restaurants yet nothing fancy but good food in a number of locations. on September 19, 2011 1 out of 1 members found this review useful. One of my favorite rides. The entire area is filled with one great ride after another. This is sort of a taste of what each area of southeastern W. Va. has to offer. Beutiful views along the Greenbrier River valley, roads are in surprisingly good shape. Traffic can occur, but I haven't had too many times when someone was behind me. Droop Mountain Battlefield is a great stop. Rt. 150 (Northbound on 219, take left on Rt. 39 to Rt. 150) is a great addition to this ride. Ride 150 to the stop sign, turning left will take you back to Rt. 219.